Central Banks at Risk of Default? Central banks do not play games with the markets but it sure feels like we are being played by someone! Earlier this year the Bank of Japan, Federal Reserve and the European Central Bank all had similar balance sheets at around $4.5 trillion. As we know, over the past ten years all three have risen from lower levels but have seen faster expansion by the BOJ and the FED gaining pace to now catch the ECB. Foreign exchange rates are always subjected to inherent volatility that is thrown into the mix. However, given the recent extremes on all fronts, there has been uncanny similarity around end of Q1’ 2017. Typically, a central bank balance sheet would off-set Assets against Liabilities and capital. In times of crisis it is common the central bank assumes the role of lender of last resort. Assuming the crisis was 2007/8, then it should be normal to expect the balance sheet to now shrink back to the levels of the pre-crisis era. However, we have heard many comments recently from the FED about re-normalizing their balance sheet but the BOJ and ECB are set to carrying-on for the foreseeable future. Focusing now on the first two, BOJ and FED, the process is so much simpler because much of the debt is consolidated and displays a meaningful explanation of their economies. The heavyweight here is the BOJ with assets held close to 100% of GDP but the risk here could be off-set by the currency. Japanese debt is held domestically because of the currency controls. Hence, the yen could collapse to devalue the debt fairly easily once the markets wake up and smell the roses. The FED never came close to absorbing the full national debt or a percentage of GDP as has taken place in Japan or Europe. Turning to Europe, the equation becomes far more complex when you consider the case for the European Central Bank. Since they initiated the APP (Asset Purchasing Programme) we have seen a need to follow cash within the components of the ECB itself. Within the European structure each central bank buys their own debt in relation to the size of their economy. The guidelines covering this activity are entitled Target2 and are easily found on the ECB website. What should be monitored closely is the trading between sovereigns, the rates at which all are traded, who the counterparties are (where they are located both domestic and international), and FX forwards’ trades that match the transaction dates. In many cases the NIM (Net Interest Margin) for many banks looks terrible but that is because the profit will appear in the FX books (which is the other side of the trade). Many reasons for the discrepancies’ from following the cash to liabilities, but Target2 and the concerns surrounding this are only recently starting to make some take a closer look. Much has been published about Target2; so, let us concentrate on the fact that both Spain and Italy owe Germany around $400bn each. Neither the BOJ nor the Federal Reserve have this problem (internal macro issues) so from this angle alone there should counterparty risk that must be factored in. However, as we know the 10yr Bund (0.45%) trades around 185bp through treasuries (2.30%) and even Spain and Italy are negative 70bp (1.6%) and negative 20bp (2.10%) respectively. In short, we are seeing Spanish and Italian domestic investors moving away from government bonds thereby aiding capital outflow. This is fine for individuals and Spain/Italy but is just moving the risk up the food chain. As we know the ECB owns around 40% of the European government bond market as we currently stand. Obviously, at these spreads the market is hardly reflecting appropriate risk and questions the likelihood of any easing without having a huge implication on both spreads and risk. The question should also move to counterparty risk for not just Germany but ultimately the ECB! Maybe they should read their own recently published report (ECB guide on materiality assessment – 25thSeptember 2017) as they increase the awareness of counterparty risk and the Credit Valuations Adjustment, they are not applying that to themselves. QE has broken the capital markets, distorted risk and has sheltered geographies from the true effects of capitalism. If the central banks were playing poker you could say the ECB has just gone “All In” – its just a question now whether the markets call their bluff or fold. What we are looking at is the risk of actually central bank defaults. This has not taken place since the defaults of government central banks in Amsterdam and Sweden. Posted in financial reset, The Event. As our readers know, our articles can be a bit lengthy, but we like to fully educate you on our topics so that you can take the message anddisseminate to your constituency in a manner that will resonate with them. Not everyone will need to know all the details, but for those reading this article, you are at the top level of the underground information pyramid for the New Fourth Estate and will need to know background and strategies for going forward. The two halves of the bills look like two entirely different notes! 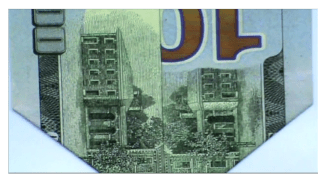 On the left side, we have the old FRN which will be faded out just as the old $100 bills are being destroyed now and replaced by the hybrid FRN-USTN. 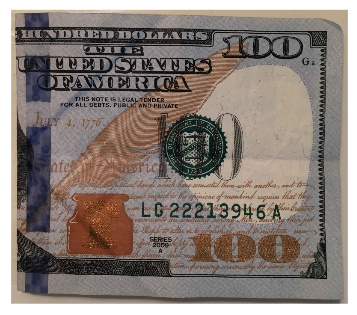 On the right side we have the new currency hiding in plain sight.It is the right side of the $100 bill that is now “legal tender for all debts, public and private.” This statement is no longer on the FRN side of the bill. 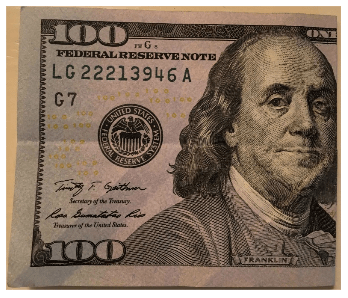 As you hold the folded new $100 bill in your hand, it is though it hasbeen designed to be a redeemable “coupon” where one would tear or cut the left side off the bill, discarding it for the worthless paper it has become. There is even room to cut the bill in half without damaging the 3-D security strip. This leaves the right side, ornate with gold, to be used as transitional legal tender until a new currency can be printed and circulated. Think“out of the box” and you will see that there is no rule about what the dimensions of a bill should be, other than vending machines that require a certain size of a bill. We could certainly exchange this new currency for goods and services. Even though it would be one-half the size of the old bill, it would be far more valuable. By eliminating the left side of the bill, the Federal Reserve side, we will be discarding nothing but the yoke of financial slavery. We are not suggesting or advocating destruction of currency. When the system is ready to be collapsed, it will be done like the controlleddemolition of World Trade Center building #7. American citizens will be given notice and will be instructed how to exit the old Federal Reserve currency system. But in the meantime, Patriots may want to switch out their old FRNs for the hybrid note. By sneaking in the new currency on the back (or side) of the old currency, we are soft landing this behemoth Hindenburg fiscal balloonbefore it traps all of us in its fiery flames. By nullifying the old FRNs and accounts held digitally outside of the U.S. banking system, we would not have to face extreme inflation or the total collapse of the dollar. Trillions of dollars would be wiped out of the global market, giving our new gold-back dollars and digits value again. It is time to face the inevitable: Fiat currency ALWAYS fails. If you are surprised by this truth, then please do some homework on all the fiat currencies that have been devised from Nero’s devaluing of thedenarius, to Jekyll Island and creation of the Fed, to Richard Nixon and the complete severing of the dollar to the gold standard. You only think the U.S. fiat currency is safe because it has been propped up so many times during your life time. But it will fail and the end is here. Posted in financial reset, New US Currency, The Event.